Hi everyone! 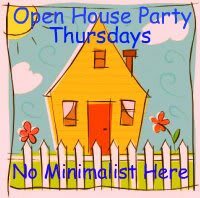 Just wanted to share a link to a great open house party today hosted by Sherry @ No Minimalist Here. Please stop by and check it out. Sherry is featuring The Yellow Cape Cod today as her open house feature in a flattering post with a tour of my home. Please stop by and link up your latest project. Thank you, Sherry! Great party! I have already been over looking, and your home looks beautiful! Meant to come over and tell you last night. Isn't Sherry just the sweetest?! I recently found your blog and LOVE it! This is exactally the style I have been looking for to update my home and hope to inslist your help. Do you have any pics of your kitchen on your blog? I would love to see it. I am heading right over! Thanks, Guys! Yes, Teresa, Sherry is the sweetest. I love her blog and her parties! Hey Noelle, thanks for stopping by Sherry's blog! Hope all is well. Shelley, I would love to porvide an online design consultation for you! Please let me know when you are ready. My kitchen is my dirty little secret. It is undergoing an update and I will post before and after pics on my blog soon. Thanks for stopping by. Sarah, It was my pleasure to feature your home at this weeks party. Thank you for participating in the Open House party and I appreciate the mention. Take care. I saw your elegant house in one of a house party posts. I'm so in love with you house. Hi there! I found your blog through Sherry's and just had to come over and take a look. I'm soooooo glad I did because it is just chock full of gorgeousness. :-) I'm sure I will now go and spend a shameful amount of time looking through your old posts! LOL!